On October 7th, 2009, a strange-looking formation was seen in the sky over Moscow. When it appeared, scores of supernatural enthusiasts speculated that it had been created be an alien spacecraft. Turns out, it was actually a hole-punch cloud. 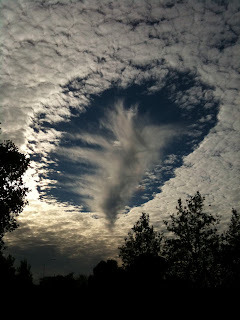 Because the center of the formation appears to be a falling streak of clouds, nepholologists call it a fallstreak hole. A fallstreak hole is a large circular gap that can appear in cumulus clouds, usually at an elevation of six kilometers or more above the Earth. Such holes form when a cloud is made of both ice crystals and super-cooled water droplets that exist together in a delicate balance. When such a balance occurs, it only takes a slight disruption, such as a passing jet, to set off a chain reaction that transforms the super-cooled water droplets into ice which clings to existing ice particles. The quick build-up of ice falls from the cloud and dissipates the water, creating a void. Hole-punch clouds are rare, but when they do form, they’re large enough to be seen for many kilometers in every direction. 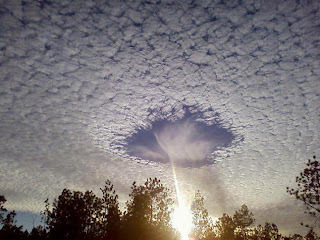 Because they are so rare and have an unusual appearance, fallstreak holes are often mistaken for UFOs. Upon further investigation of the Moscow hole-punch cloud incident, it seems to have been inadvertently caused by the Russian Air Force—at the request of Yury Luzhkov, Moscow’s mayor—to test its cloud-seeding program. The idea was to fly over the approaching clouds and spray silver iodide into them. Moisture would quickly condense around the fine particles, creating snow much sooner than it would normally. In theory, if the clouds shed enough precipitation before reaching the city, Moscow could avoid the usual heavy winter snowfalls for which they are so well known. Luzhkov said such efforts could save the city $4 million in snow-removal costs each year, and improve their quality of life during winter. But there was a problem: Mother Nature refused to cooperate. The pilots needed two weeks advance notice for maximum effectiveness, yet meteorologists had a hard enough time predicting snowfall two days in advance. So while Luzhkov blamed the hapless weathermen and promised to find a solution, Muscovites did not hold their breath.